An account has been established on behalf of the four families forever changed by the tragic car accident that occurred the evening of Friday, Nov. 21. Those wishing to donate can go to any branch of Bank of the West and deposit funds to the “Four Friends from UNM” account. At Christmas, the funds will be equally divided among the families of Briana Hillard, Matt Grant, Julia Thompson and Joseph Mendoza. Matthew Grant and Briana Hillard lost their lives in the crash; the other two passengers, Julia Thompson and Joseph Mendoza survived and were just released from UNM Hospital. Facebook friends of Hillard and Grant change their profile picture to a ribbon with the letters of their sorority and fraternity. Hillard and Grant were tied to the Greek Community; Hillard to Pi Beta Phi, Grant to Sigma Alpha Epsilon. 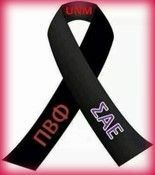 Some friends of the two changed their Facebook profile picture to a black ribbon with the Greek letters of the sorority and fraternity. In a strange twist of fate, the owner of the stolen truck is a former assistant football coach at Eldorado; in fact, he coached Joseph Mendoza. Coach Gentry and his wife Anita are devastated by the news that their vehicle was used in this horrific accident and decided to take action by setting up the account at Bank of the West. A memorial was held for Grant and Hillard this past Tuesday. Prior to that, numerous flowers and cards had streamed into the Student Activities Center in the SUB.